I’ve been working on my own children’s book for about a year and a half, in between other book projects I’ve been doing for clients. Rapunzel was one of my favorite fairy tales as a kid, augmented by the Peck Gandre Rapunzel paper doll I had then! My reason for wanting to retell the tale, aside from my love of it, was that the original (as with most fairy tales) really smoothes over a bunch of complications! My idea was to create something a little bit more epic…and I’m really hoping to finish it this year (since I’ve learned after beginning the project that Disney is coming out with Rapunzel Unbraided next year). Here is a sneak peek! For secrecy, I’m not going to explain the drawing. It’s only concept anyway. 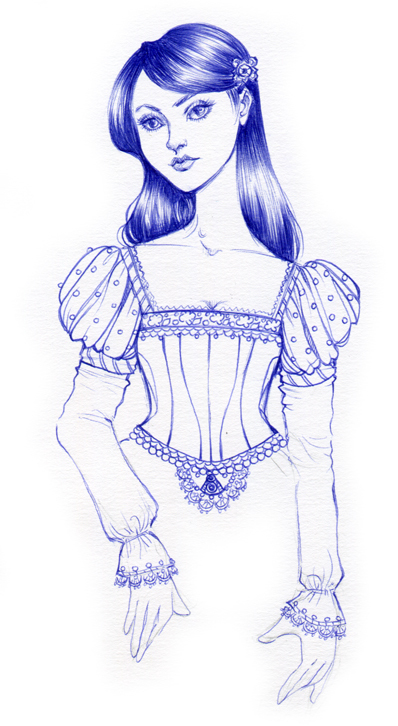 This is a ballpoint pen sketch that's then messed around with in Photoshop.